The Sab is split into 4 groups, the largest being the Olympic group, only the Olympic group (those that turned up)as far as I know, we're part of the show of hands. They were shown 3 pictures of what the club HOPED the stadium would look like post moving in.there's no guarantee it will, in fact I'd bet it won't . A member of the SAB asked if we could just have a show of hands in respect who would support a move into THAT stadium if it looked as it did in the drawings. The vast majority put there hands up, not everyone did though, and there was no count. The SAB are not stooges but as prob expected by those that didn't vote the club will be pleased with that level of support and will use it as proof of what they believe the can achieve once plans are out. So where's that supposed to be then? hadleighhammer wrote: The SAB is a side issue compared to the Board's disgraceful actions, but is nevertheless an issue. Hadleigh , in effect , that's what I did , and I posted as much on this very website the day following the SAB meeting , in the OS poll 4 thread .Page 7 or 8 of that thread . Do you think G&S&B saw your and others non-vote in that way though, or could not voting could be easily misconstrued by them in anyway? In effect is nice, but it never beats someone actually coming out and saying it though. I'll bet there is nothing on the minutes about those not voting. Even if they did note this, they could all be brushed aside as abstaining rather than being against. I'm shocked no-one on the SAB thought of also asking for a count of hands of those against the move so it went on record. Had it done so you wouldn't have got all the texts and questioning from those at games. A vote only "who's for" rather than a "who's for and against" was always going to play into G&S&B's hands to manipulate. The club's actions are the main issue you're right, but as I've been saying the SAB have handed them that opportunity. Any Old Iron wrote: Doc. I didn't say that they're not alright, I sure most of them are. It's just that they're serving a purpose for our lying directors. Clearly you do have a problem otherwise you wouldn't have referred to us as stooges. This infamous vote was based on us getting a football friendly stadium. What I saw at that meeting was a group of people with 1,000's of games under their belt (I've been going for over 20 years) who asked relevant questions and are trying to do something positive. We've pulled together 200 pages of supporter feedback which will hopefully help the club in negotiating a better deal (there was a lot of commnent in that document that ranged from negative to downright opposed). Stooges? A cheap shot at people who care a great deal about the club. People who don't deserve being on the end of your mis-directed anger. 200 pages of supporter feedback to negotiate a better deal? It wasn't about negotiating a better deal, it was about telling the club what those fans wanted, which the club ignored. And then they lie twice about the show of hands, 1st Brady and then in the official statement. May not be a stooge but I certainly feel the club are taking piss in the use of the SAB in their propaganda. 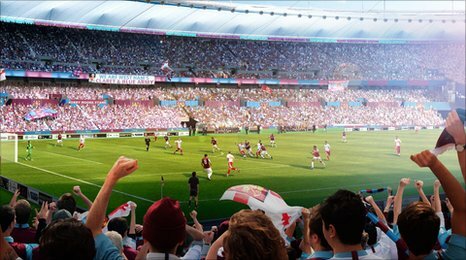 mywhufc wrote: 200 pages of supporter feedback to negotiate a better deal? It wasn't about negotiating a better deal, it was about telling the club what those fans wanted, which the club ignored. And then they lie twice about the show of hands, 1st Brady and then in the official statement. May not be a stooge but I certainly feel the club are taking piss in the use of the SAB in their propaganda. That's right. It was about telling the club what the fans want. I just think that the club have an opportunity to use it to their advantage. How do we know the club have ignored it? If the club win the bid, then they can say to the OPLC, "Look, the supporters favour a move if it can work for us. As you can see, a lot of them have reservations though" That's the starting point for negotiations. In terms of the show of hands, perhaps Brady needs to correct her previous statement. I think there needs to be wider consultation, but haven't the club confirmed that this would happen between us winning the bid (at which time details can be released) and us signing contracts. I think what the club need to do is give us some information as to what form consultation would take. All that aside, I still think referring to members of the SAB as stooges is bang out of order. These are people who have stepped up, as have you via the mywhufc campaign and the WHUView team. While we may all passionately argue our case on here, it never descends into name calling. Terry, by referring to SAB as stooges is not name calling. It's just a description of how a group of well meaning supporters are being seen and used by the directors. I repeat that a definition of stooge is "A person who serves merely to support or assist others". That's all the directors want from you, your support and assistance (in getting the result they want). I don't know how you can argue with that. They don't want to listen to opposing views, as evidenced by Gold's annoyance at my unwillingness to acept all the bull during my call to him. Whatever you few dozen SAB guys say, it comes down to one thing and one thing only - the club should ballot at least all season ticket holders and members. And do it now before it's too late. You contradict yourself in your first sentence. No need to repeat the definition - i know what it means. Are you or are you not calling the SAB stooges? If you are, then that's name calling and I think that's poor. Turning on fellow supporters is very poor. We'll just have to agree to disagree. Yeah I agree with Terry. It's the process that's wrong - for one reason or another - not the fans who have tried to get involved. It's the lie about 'detailed plans' having been shown that worries me far more than the 100% vote to be honest. Doc H Ball wrote: Yeah I agree with Terry. It's the process that's wrong - for one reason or another - not the fans who have tried to get involved. I thInk what this has demonstrated is that the one thing that's been missing has been a strong independent elected supporter's group. What value would a HISA type organisation have now? An organisation led by elected representatives. Ultimately though groups like that need a groundswell of support. Perhaps in this Internet age, a group like that would have a better chance of survival. mywhufc wrote: The Sab is split into 4 groups, the largest being the Olympic group, only the Olympic group (those that turned up)as far as I know, we're part of the show of hands. They were shown 3 pictures of what the club HOPED the stadium would look like post moving in.there's no guarantee it will, in fact I'd bet it won't . A member of the SAB asked if we could just have a show of hands in respect who would support a move into THAT stadium if it looked as it did in the drawings. If SAB are prepared to be manipulated in this way then 'stooges' is a reasonable description, isn't it? ]Well no..... They were asked if they were prepared to support a move to the ground as in the pictures.....if it looked very good in the pictures they voted yes which surely makes perfect sense? ?